With the theme of “Visualization of the momentum”, Kiyoshi Takahashi is a Sapporo-based artist, exploring his installation works and performance art that combines aspects of manga, calligraphy and music. 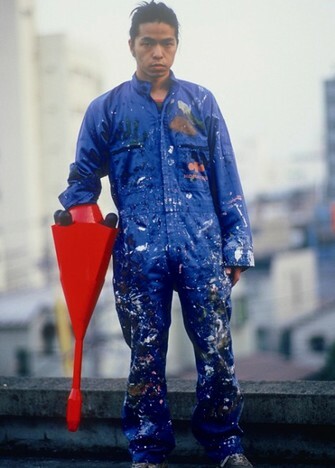 His bold and three-dimensional works that employ the concept of onomatopoeia appears various places in Sapporo and worldwide. 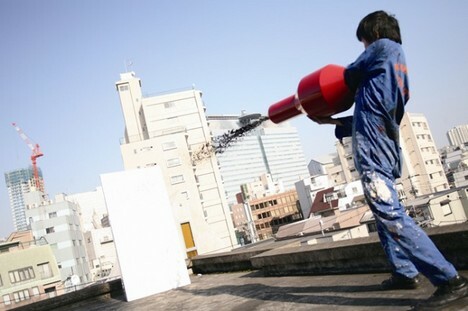 Contrast to the solid appearance, his installation piece provokes a sense of comfortable exhaustion created by his use of onomatopoeia, and gives a strong impact to the viewers. 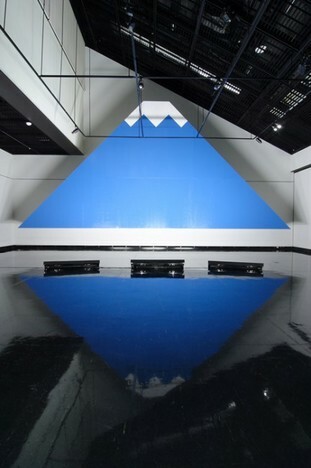 His new solo exhibition “Hybrid Art III Into the Legend…” is now being held at CAI02 in Sapporo. been since your last exhibition? It’s been 3 years in Sapporo. As a solo exhibition it’s been roughly half a year, since I held an exhibition in Auckland, New Zealand this spring. How did you start working as an artist? I wanted to be a manga artist since the early years of my elementary school. So I was constantly drawing manga and applied to a competition. I won that competition and I was appointed an editor. However, the editor gave me a lecture, saying that my drawing skill was not good, so I had to study drawing. That was when I was about 20 years old. Then I went to an art college, where I met Mr. Hata, who is an organizer of CAI. His class was very fascinating and I found out that he was also managing the CAI art school. I attended the night school there. A year later, when they decided that the CAI art school run during the day, I quit the art college and moved to the CAI art shool. 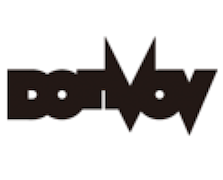 One of the characteristics of your works is the use of onomatopoeia from manga. I guess that came from the fact that I was aiming to be a manga artist once. I was also doing calligraphy, where I learned the pleasure of writing letters, and my fondness for music led me to work at Tower Records. The combination of manga, calligraphy and music, which are the 3 elements that I love, is the “onomatopoeia” that I form. You are now working with the theme of “Visualization of the momentum”. Please introduce artworks you are now working on. 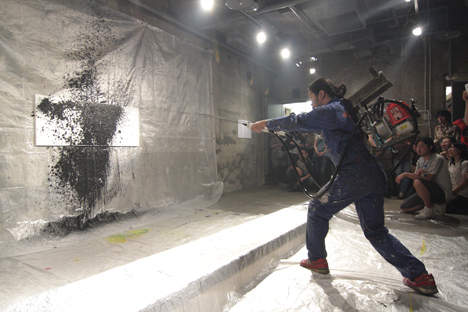 There are 2 types of works in the “Visualization of the momentum”: the “Brush Series”, an iron-made brush jets out ink and the “Onomatopoeia Series”, three-dimensional installation pieces using onomatopoeia used in manga. The “Brush Series” is based on my own idea that ‘all things give off ink are considered to be brush’. 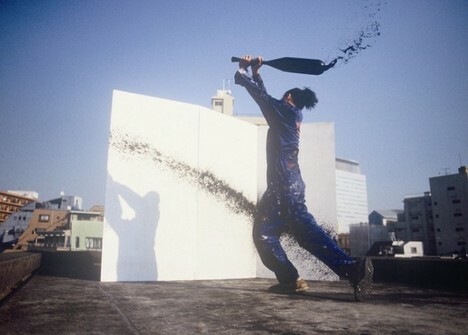 For example, I make a solid brush using a bat or a wearable gun on the left arm, which allows me to do a performance art by jetting out the ink and creating two-dimensional artworks. One artwork create the 3 elements of object, performance, and painting. 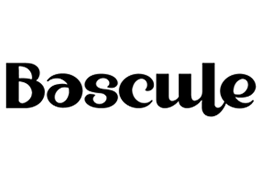 The “Brush Series” originally started off by drawing a calligraphic manga, which was around 10 years ago. I was drawing a manga where people with various types of brushes compete at calligraphy. At that time I thought “it would be interesting if I could convert this idea intothree-dimensions”. I thought I could put it in the context of the contemporary art. But as I was drawing manga at that time, I kept the idea for a long time. As the desire to create the idea grew stronger, I decided to turn the idea into the reality and made an artwork called “psychogun” (2007). Besides your first piece from the Onomatopoeia Series “doon”, what did you make? In Belfast, Northern Ireland, I made a work called “Belfaaaaaaast!” (2008), where the name of the city is portrayed in a manga style letters. I also made a work called “crash” (2008). As a part of the artist in residence program, I worked in a classroom at the elementary school for 2 weeks and created an artwork called “gogogogogogogo” with students. 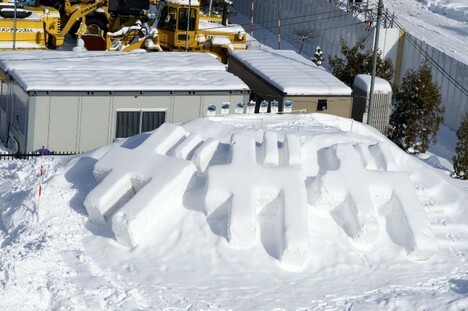 There is also “gagaga” (2009), where the sound of a snowplow was depicted using the snow. Although it is not an onomatopoeia, there is also a piece called “GO” (2009) that I made for a group exhibition in China. This piece is now under reproduction as a permanent collection of a park, which will be open in the end of this September in Tumen, Jilin city in China. 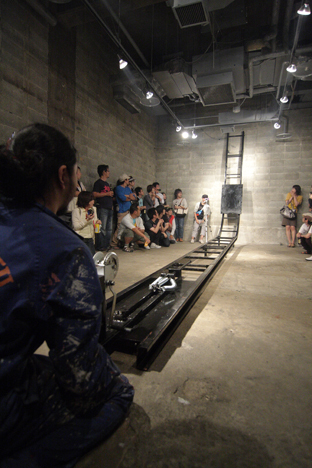 There is another installation piece called “baan” (2010), which was exhibited at the Sapporo Station. In addition to these works, I create small two-dimensional pieces. 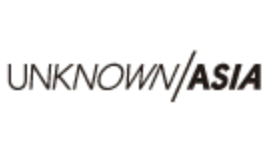 What are you showing at your latest solo exhibition at CAI02? I always wanted to make an artwork using an engine, and finally turned the idea into reality and made a piece called “Beam Saber Engine”. This has double function. Although it is possible to write letters, drawing with this machine is close to images. For ink, I use Sumi ink. I put my focus on brushes and ink, because I have learned calligraphy. An action painter such as Jackson Pollock, for example, did not emphasize the importance of the use of brushes, whereas in the traditional Chinese calligraphy they value each equipment of Chinese inkstone, ink, paper and brush as arts and crafts piece, which is called as Four Treasures of the Study. The attachment to the equipments is an Asian characteristic, and I think I am following that track and continue to value it. 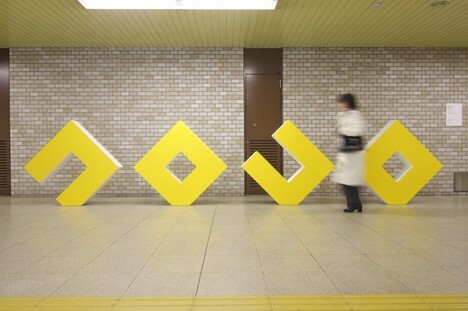 Until now, the “Onomatopoeia Series” has been about transforming the onomatopoeia into three-dimensional installations. The new piece “Gyuun” shown at this exhibition seems to propose a new direction. “Gyuun” is a work made from iron. It has a rail with a plate on top. There are wheels on the bottom of the plate. When the rope is pulled to the maximum, the spring pulls back the plate, triggering the plate to climb up the rail. I thought the momentum of the plate climbing up the right-angleed plate, the feeling of ‘Gyuun’ (onomatopoeia of an object moving fast) could be universal. I made this piece with an idea to create something that portrays its movement and form without using words. I came up with the idea of “Gyuun” about 3 years ago. It was when I made a huge Mt. Fuji installation piece for a group exhibition “Born in HOKKAIDO” (2007) at Hokkaido Museum of Modern Art. One day when I was reading a book at home I came up with an image, where the ‘Gyuun’ letters climbing up. 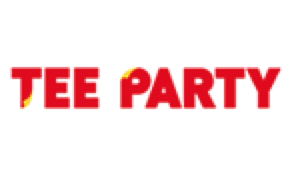 The image was stuck in my mind for a long time. And 2 months before the exhibition, I got a new idea, a black plate climbs up the rail. It still is a work of the “Onomatopoeia Series”, but concentrating on the momentum of the ‘Gyuun’, cutting out the use of the word itself. With Gyuun, I think I could come more close to the core part of my concept “Visualization of the momentum”. What does the title of the exhibition, “Hybrid Art” mean? It is something that I made up. There was a wrestler called Masakatsu Funaki in a mixed martial art group called Pancrase. He was described as a ‘Hybrid Wrestler’. A wrestler is basically required to train his body. But in his case, as a hybrid wrestler, he trained both his body and his mind, allowing him to be stronger. The word ‘Hybrid’ attracted me, and the idea behind it, combination of body and mind, was also cool. So the name “Hybrid Art” is a copy of Funaki’s ‘Hybrid Wrestler’. In terms of the “Brush Series”, it is a hybrid of calligraphy, manga, and action painting like what Jackson Pollock has done. I believe a new thing will be created from the mix of those elements. 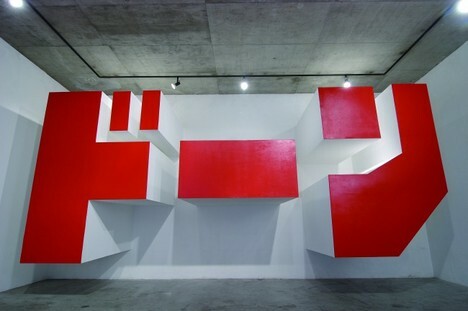 The “Onomatopoeia Series” is a hybrid of word, sound, and minimal art like Donald Judd. 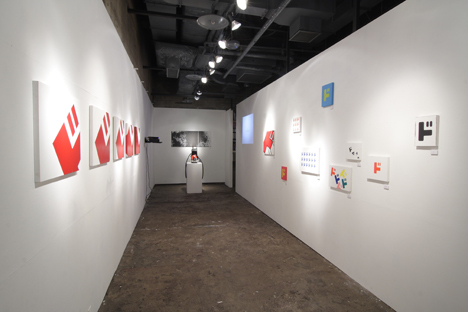 You are also exhibiting a series of works using the Japanese letter “do”. As for the piece using “do”, I made “doon” as well as “dodododododododo”, which was created in New Zealand with students. I recently came to understand that the letter ‘do’ has an ability to express something extraordinary such as ‘Do-Hakuryoku’ (Super-Intensity), ‘Do-Konjo’ (Super Spirit) and ‘Do-Dekai’ (Super-Large). Art is something that is beyond what it is. So the realm of ‘do’ is a realm of my desire to my achievement “to go beyond something”. Is there any artists who influenced you? There are so many but my most favourite artist is Yan Zhenqing, a Chinese calligrapher. He is a calligrapher who lived 1200 years ago and he is one of the two best. Another figure is Wang Xizhi, who is a lot like Bach in terms of music. At first I did not understand Yan Zhenqing’s works. When I was about 30 and lived in Tokyo, I asked about Yan Zhenqing to my calligraphy teacher. Then she showed me Yanthe Poem of General Pei by Yan Zhenqing. I had no idea what it says in the poem, but I could not stop crying. I was surprised at myself. The sense of freedom in his work is truly amazing. You have shown your works overseas. What feedbacks you get from them on the “Onomatopoeia Series”? For Japanese, the work that utilizes alphabets does not instantly communicate to them but the work with katakana does. The opposite thing can be said in abroad. I found a new direction on the new piece “Gyuun” from the “Onomatopoeia Series”, which may provide a solution to that. There are so many. I have plenty of ideas. I would like to work in various places, not just Sapporo but outside Hokkaido, which include overseas.In addition to the “Brush Series” and the “Onomatopoeia Series”, I am currently considering an installation work for the new “Japan Series”.